Recording artist Pokey LaFarge will perform at the Astra Theatre on Saturday, October 6. 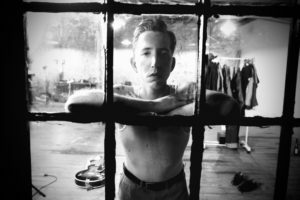 American musician Pokey LaFarge will perform a solo acoustic set at the historic Astra Theatre on Saturday, October 6, 2018. Doors for this intimate performance will open at 6:30 p.m., a yet-to-be determined opener will perform at 7:30 p.m., and LaFarge will take to the Jim and Pat Thyen Performance Stage at 8:30 p.m.
LaFarge is a musician, songwriter, bandleader, entertainer, innovator, and preservationist at the forefront of American music. He has a creative mix of early jazz, string ragtime, country blues, and western swing. Tickets for the show are onsale now by CLICKING HERE and are $36.95 for VIP (preferred parking and seating, early venue access with refreshments, and, if available, an artist meet and greet), $26.95 for the main floor, and $26.95 for the balcony. This will be the first reserved seating show at the newly-renovated Astra Theatre. Season ticket holders and business members will be contacted with their assigned seat information. In 2006, LaFarge independently released his first album, Marmalade, and his second solo album, Beat, Move & Shake, was released in 2008 by Big Muddy Records. Riverboat Soul, his first album with The South City Three, was recorded in Nashville using only vintage instruments and electronics. Released in 2010 by Free Dirt Records it went on to win the Independent Music Award for “Best Americana Album”. The group’s second effort, Middle of Everywhere, won the same award in 2011. LaFarge has collaborated with the likes of Jack White of the White Stripes and has released one album on White’s Third Man Records. He has appeared on The Late Show with David Letterman, Conan, A Prairie Home Companion, and has been a featured performer on stages across the country and world. For additional information about LaFarge, please visit www.pokeylafarge.net. Tickets are still available for the May 12th Smooth Hound Smith performance at the Astra, as well as for the screening of the Wizard of the Oz on June 2. For ticketing and more, please visit www.TheNextAct.org. Funding support is still needed to close a financial gap and eliminate or reduce the amount of money the organization will need to borrow to complete the renovation. A 2018 membership campaign is underway and, while any denomination is appreciated, incentives begin at the $25 level (t-shirts). For additional information, including more incentive details, please visit www.TheNextAct.org. ← Wizard of Oz coming to the Astra on June 2!